LaSalle D. Leffall Jr., a noted surgeon and oncologist, is the Charles R. Drew professor and former chairman of the Department of Surgery at Howard University, where he has been on the faculty since 1962. In 1979, as the first African American to serve as national president of the American Cancer Society, he focused attention on the increasing incidence and mortality of cancer among black Americans, creating an innovative program to address cancer disparities among ethnic populations. 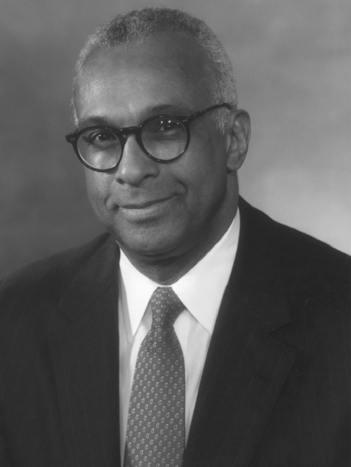 Dr. Leffall was also the first African American president of other national organizations, including the Society of Surgical Oncology, the Society of Surgical Chairmen, and the American College of Surgeons. His positions of national prominence include membership on the National Cancer Advisory Board, the American Board of Surgery, and the President’s Cancer Panel. Among his numerous honors are the Presidential Award from the D.C. Chapter, American College of Surgeons; the James Ewing Medal of the Society of Surgical Oncology; the Charles R. Drew Medal, Drew Postgraduate Medical School; and four honorary degrees. Dr. Leffall was elected to membership in the Institute of Medicine in 1973. A graduate of Florida A&M College, he received an M.D. degree from Howard University College of Medicine, ranking first in his class; trained in surgery at Freedmen’s Hospital (now Howard University Hospital); and completed a surgical oncology fellowship at Memorial Sloan-Kettering Cancer Center. His writings include a book of memoires, No Boundaries: A Cancer Surgeon’s Odyssey, (Howard University Press, 2005), and Equanimity Under Duress: Calmness and Courage in the Battle Against Cancer (Howard University Press, 2014).